What does Jupiter in Leo mean? These people are explosive and full of life all the time. Leos are larger than life, and life tends to give back to them ten-fold. Their charisma and can-do attitude attract good fortune. And, Jupiter in Leo always believes luck is on their side. With an optimistic outlook on life, they can do no wrong, and they feel blessed in return. Jupiter represents our travel habits, the things we do to bring in wealth and good fortune, and assessing our values. 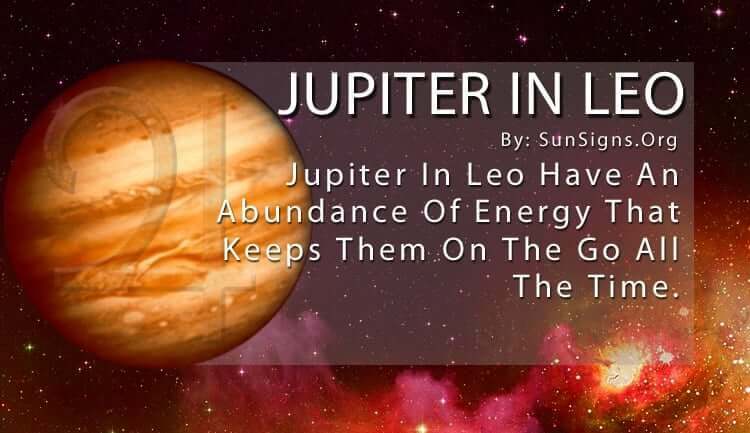 So with Jupiter in Leo, they have an abundance of energy that keeps them on the go all the time. And they need that much energy for they can’t contain their excitement and desire for the next adventure. This kind of attitude often draws in great opportunities and keeps those positive vibes going to the next big thing. What does it mean to have Jupiter in Leo? The Leo zodiac sign in astrology is all about the big things – flashy parties, grand entrances, and exciting challenges that keep them happy and engaged in the world around them. Although the Jupiter in Leo doesn’t often plan, they can take on any new problem with ease and style and won’t quit until it’s done. This last part is as much about the recognition as it is a strong sense of work ethic. But either way, it gets the job done and more often than not brings in new ones. And this approach to life is a big part of their value system as well, for they are quite generous toward their inner circle of family, friends and loved ones. The Jupiter in Leo is just as grand with their gestures of affection as they are with treating themselves. It allows them to flash their social status for everyone to see. And this kind of extroverted lifestyle often gets results. The Leo Jupiter people aren’t afraid to put themselves out there and take risks. They will do whatever is necessary to finish the job and do it in a way that takes them further in their career or their personal life. They automatically take charge and people stand up and notice. Because of their brazen manner, they don’t beat around the bush. And, people respond favorably to their honesty. The only thing they have to be cautious of is being fanatical. Sometimes the Jupiter in Leo gets so wrapped up in their monologues about justice or hard work or sticking together that they become melodramatic in their delivery. And you will hear them roar if you call them on it! But if they can keep their ego in check, they will go far in life. Besides, it’s because the Jupiter in Leo natal people have such strong beliefs and opinions that they can get things done. They don’t waver on their moral code, and they pride themselves on being fair and ethical. It’s important for them to keep their dignity intact. That’s the best way to attract wealth and power. And because of their magnetic personality, they don’t often have trouble acquiring these status symbols. This helps them to remain stable and secure. This, in turn, brings in more luck and good fortune. They are brave and self-reliant, and they know how to go after what they want. Smart, funny, and honorable, they are always at the center of attention and happiest in the spotlight. This is the winning combination that keeps them healthy and vibrant, and for Jupiter in Leo, there’s no better way to live your life!